Divisions: The country of Israel is divided into six districts including Northern, Haifa, Center, Tel Aviv, Jerusalem, Southern, and Judea and Samaria. Each district is then further divided into sub-districts. The largest of the districts by population is the Center district. The largest by area is the Southern district. Coat of Arms - A shield with a blue background, a Menorah in the center and two olive branches on each side. Description of flag: The flag of Israel was adopted on October 28, 1948. It has a white background (field) with two horizontal blue stripes across the top and the bottom. At the center of the flag is a blue Star of David. The Star of David represents the religion of Judaism and the stripes represent the stripes on a Jewish prayer shawl called a tallit. National Holiday: Independence Day, 14 May (1948); note - Israel declared independence on 14 May 1948, but the Jewish calendar is lunar and the holiday may occur in April or May. 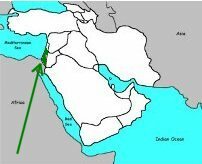 Origin of the name Israel: The name "Israel" comes from the patriarch Jacob in the Bible. Jacob was given the name Israel from God after he wrestled with an angel. Jacob had twelve sons who then became the twelve tribes of Israel.